When six different United States West Coast coal export terminal projects were first aired, few of the proponents realized just what a demanding and energy-sapping process they were up against. Just two years ago, there were plans to create over 125 million tonnes of new export capacity through a variety of port projects in Oregon and Washington. They aired a compelling case.There were no US coal export facilities on the entire West Coast back then and yet world coal prices were buoyant and demand in Asia beckoned. Serving Asia from the US East Coast wasn’t the answer. At home, coal was falling out of favour boosting exports of coal stocks not wanted on a domestic market as cheaper, cleaner natural gas was being touted as the answer to future power generation. But, the voyage hasn’t been smooth sailing. Coal prices have softened by up to 40% in 2013 over what was offered when the six terminal projects were first suggested. In 2012, total US coal exports topped 106.7mt (million tonnes) and they continued up by 4% year to date through June. The game changer in trying to build new facilities in the Pacific Northwest, however, has not been the weakening business case for US coal exports, but an avalanche of highly-organized opposition. This veritable green machine has swept through the coastal cities, big and small, urging a shutdown of all coal exports as “evil and the biggest culprit in global warming” through CO2 emissions. The non-stop rhetoric won hearts and minds on Internet sites and in the social media. Before long, Seattle and Vancouver city councils had passed ‘symbolic’ motions banning any future coal movements within their boundaries, even though they had no power by law to stop them. No wonder that in 2013 there are now only three survivors among the West Coast coal port proposals.The proponents say they aren’t too concerned about the short term coal industry outlook, and note that supply constraints, and boom and bust cycles have characterized coal markets for the past decade. In any case, serious efforts to put together financing are still several years away. But, the environmental protest — far greater than ever seen before — does have them hopping. The largest surviving project is a 48mt per year Gateway Pacific Terminal (GPT) proposal by SSA Marine to ship coal and other commodities from a deep-sea port to be built north of Bellingham at Cherry Point, just half an hour’s drive from the Canadian border. GPT is now amid an environmental impact statement (EIS) and the expansive scope of the review, which includes an analysis of how the project would affect human health in the state and an evaluation and disclosure of greenhouse gas emissions of end users, is attracting huge local attention. Also in Washington State, a Millennium Bulk Terminal project for the Port of Longview on the Columbia River is amid a three- month period of public comment or scoping set to end 16 November, which will determine the breadth of the future environmental review process.This two-phase project would clean up an existing brownfield site and plans to ship about 44mt a year when fully developed. In the US the green machine is forcing long and involved environmental and other assessments and if they don’t get their way they threaten a long season of litigation ahead. “Neither one of these terminal sites here in Washington is likely to be shipping coal for a long, long time if ever,” came one activist comment reported in The Seattle Times. The third survivor, and the one generally considered the most advanced along its long and winding road to approval, plans to have Union Pacific Railway haul Power River Basin coal to the Port of Morrow on the Columbia River where it will be barged to the Oregon Port of St. Helens, 53 miles inland from the Pacific Ocean. The Morrow Pacific project is being developed by Ambre Energy North America and plans to take what some in the coal industry see as “expensive and unusual measures” to appease its critics with enclosed storage buildings and conveyors, and custom-built, covered barges. At the off-load, a $40 million transloading vessel, using Siwertell screw unloaders, would initially allow shipments of 3.5mt a year, increasing to 8mt if approvals are given.Three permits have so far been issued by the Oregon Department of Environmental Quality and if a final green light is given the project could be operational early in 2015. Fallen by the wayside have been suggested coal export ports in Coos Bay, Oregon, a Kinder Morgan development in the Port of St. Helens unrelated to the Millennium proposal, and Grays Harbour,WA. 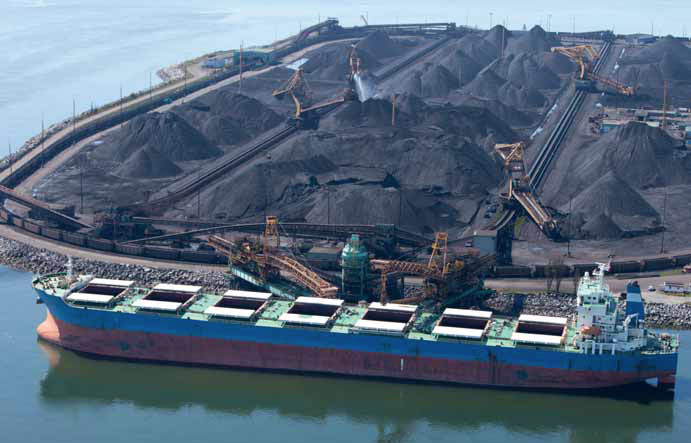 The only US coal shipments currently getting through from the West Coast to Asian buyers such as South Korea, Japan, and China have to cross the Canadian border to British Columbia and Westshore Terminals in the Greater Vancouver area. That means a rail haul of 2,500km from the coal-rich Powder River Basin in Montana and Wyoming. But, those hauls still pass through Seattle and Bellingham and are also drawing fire.The ‘northwest resistance’ as www.occupy.com and other environmental web sites have called it, has spread into British Columbia and Port Metro Vancouver where the two existing coal export ports — Westshore and Neptune Bulk Terminals — have been steadily upgrading and increasing their capacities to meet Canadian and US coal demand, while being forced to turn away business. Health officials in the US and Canada have suddenly found a voice and become aware that coal has been hauled through their areas by rail — for the past 43 years or so to Westshore, including the first trial shipment of US coal back in 1992. Now, some of the more extreme warn of the perils of dirty coal as a threat to shellfish, salmon and the entire ocean food chain; as well as human health and climate change. So far, no telling health statistics about increases in cancer, asthma, lung disease and neurological disorders have come forward, but it doesn’t seem to matter, the unsubstantiated claims appear to be enough. Amid all of the mounting green angst, Port Metro Vancouver approved a capacity increase and equipment upgrade at Neptune that drew protests. Now, a proposal by Fraser-Surrey Docks, a low- draught port about 20km up the Fraser River and part of the Port of Vancouver, has run afoul of environmentalists and even surrounding municipalities with its plan to bring in Power River Basin coal from the US by rail, transfer it to barges, and carry it to Texada Island out in the Strait of Georgia for transshipment to deep-sea bulk carriers bound for Asia. Fraser Surrey Docks has submitted what its President & CEO, Jeff Scott, calls “a vast body of work” to meet expanded environmental and other demands from Port Metro Vancouver in the approval process. It says it has listened to the community concerns and eliminated a planned stockpile, ensured the respraying of the US coal at the border with a binding agent before it comes along the Fraser River banks for unloading onto barges, and is going to add another binding agent to the coal on the barges. Stay tuned, this promises to be quite a ride in getting any new coal export facilities on the West Coast, in either the US or Canada.